What’s Going on in the Garden This Spring? The arrival of spring brings with it fresh starts and new beginnings. Now is the time to peruse the gardens, making note of which plants survived the past winter’s trickery and also mourning for a moment those that weren’t so lucky. Be sad for a minute for what has passed but then move on. See those newly opened up garden spaces as opportunities – a chance to plant something different and add new life and spice to the ever-evolving paradise that is a garden. How do I decide what to plant in the gardens here each season? I get answers to that question mostly based upon what our publication and product development teams have been up to over the past few months. Captivating and alluring photography plays a key role in how we communicate with folks. The publications team will let me know when we need photos of particular plants, and I add them to my planting list. The request could be for a portrait of a plant that’s a newcomer or an old friend that needs a fresh face. All of the gardens here serve the purpose of providing subject matter for photographic moments. The product development team definitely contributes to the bulk of my planting list. Each season we trial plants of all genres running the gamut from up-and-coming shrubs to exciting annuals. Within each category you will find not only new introductions to the plant industry but also reliable forgotten favorites that we love and which we plant in hopes of sparking their revival. This year there will be a lot of coleus candidates to plant out. The list of annual trials each season is as long as my arm, sometimes my leg, and this year is no exception. Often times, we decide on a few focus groups within the annual realm. We will hone in on a certain genus or two and include 10 or 12 plants from that group to grow and evaluate side by side. In the past we’ve featured fuchsias, begonias, and coleus. This year I will again have a lot of coleus candidates to plant out and I couldn’t be happier! Over the years, the versatility of the shady coleus of the past has expanded as the newer cultivars not only tolerate but actually thrive in the sun. 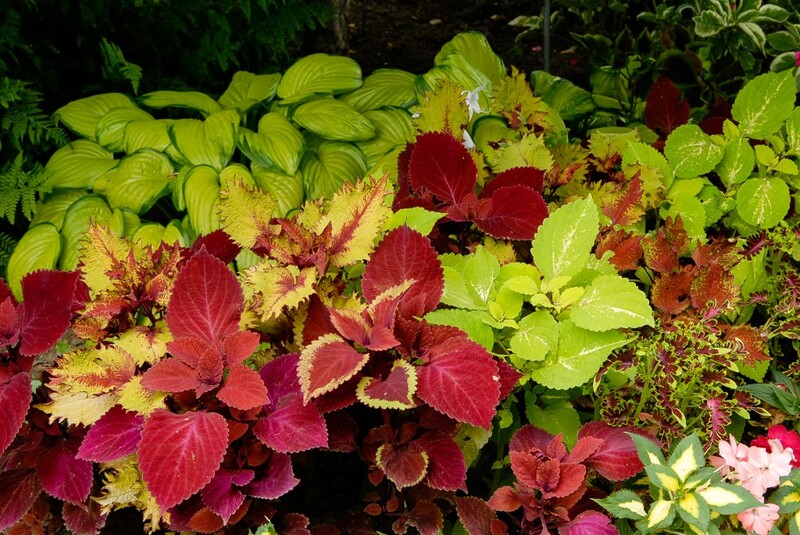 Being able to adapt to a wide variety of light conditions while providing such an array of foliage colors and textures means my good friend coleus offers lots of possibilities for adding excitement to the garden. The year we trialed Salvia ‘Amistad,’ it was the restaurant of choice for the hummingbirds that summer. The other annual focus group this year is tender salvias. I’m eagerly looking forward to having these beauties in the gardens. Not only will they be eye-catching when combined with dahlias, roses, and loads of other companions, the hummingbirds and bees won’t be able to keep away. 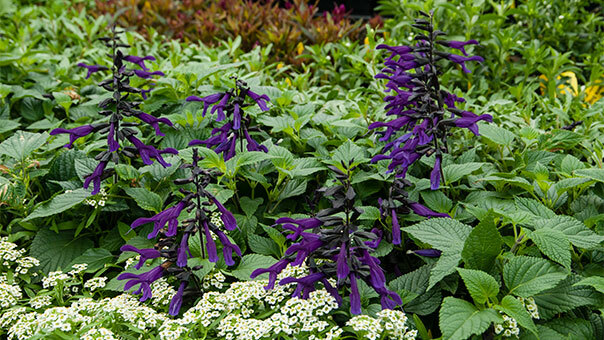 I remember when we trialed the dark-purple flowered Salvia ‘Amistad’ a few seasons back. At the time, I believed that hummingbirds only liked bright, bold colors, but that theory was blown out of the water. That Salvia ‘Amistad’ was the restaurant of choice frequented by all of the hummingbirds that summer. Pretty neat stuff to watch! I wonder what secrets of the annuals will be revealed to me this summer. 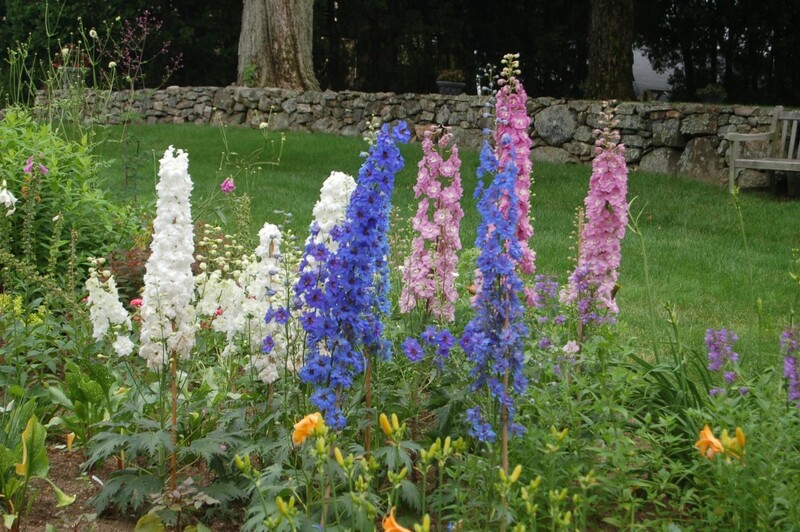 This year we will strategically combine these regal Delphiniums with complementary companion plants in the gardens. The possibility of a future feature article in a prominent garden magazine has prompted another of my planting projects this year. Down in the greenhouse, I’ve been coddling some of every kind of delphinium that we offer. The plan is to strategically combine these regal beauties with complementary companion plants in the gardens. The goal is to create some dynamite photo ops. I’ve got two years to do it and I’m optimistic. I’ve got great plants, and setting them out in sites with good drainage will help them to establish and, with a little bit of luck, flourish. The biggest hurdle is coming up with the best way to stake these royals as the flower towers start to come into bloom. I always want to stake “invisibly” if possible so as to not detract from the main event. The dahlia trials, nearly two dozen varieties, have just arrived from Holland. 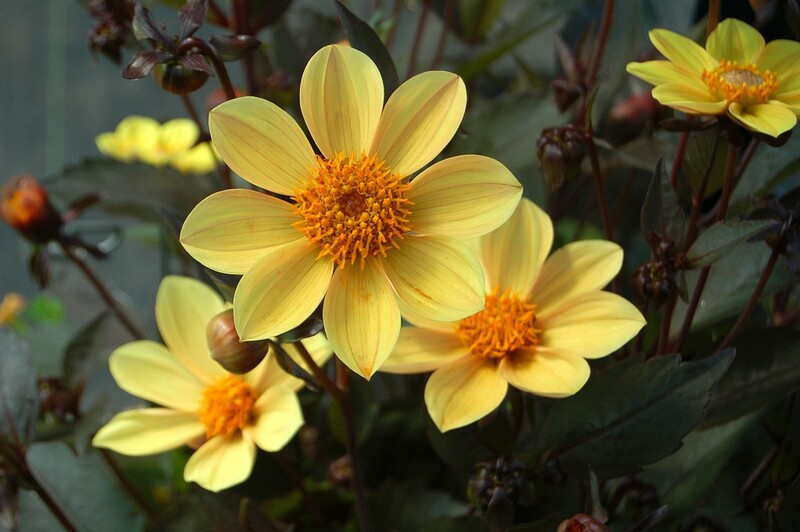 New additions to next spring’s dahlia offering will be chosen from the lot. Varieties that exhibit good behavior in the garden and display some unique attribute that distinguishes them from the current cast of dahlias offered usually make the cut. 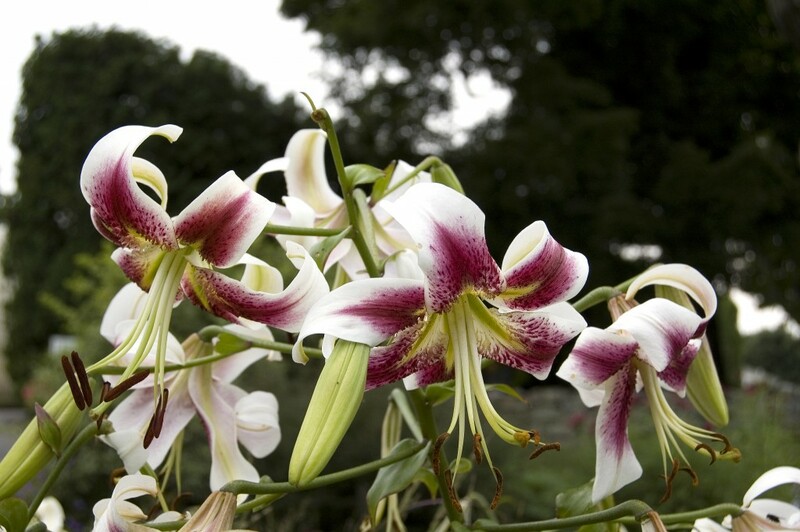 This summer, Cheryl will plunge Lilies into the gardens so that our visitors can meet the lilies up close and personal. Her hope is that folks can bask in and be enriched by experiencing the memorable, heavenly scent that is the lily. Lastly, rounding out my list of special planting projects for this season, are the lilies. Our list is extensive this spring so I’m taking advantage of this opportunity to bring the lilies to the people. I’ve reserved bulbs from our inventory requesting some from all types – Asiatic, Oriental, Orienpet, Species, and Trumpet – with special emphasis on the fragrant sorts. My intent is to plunge them into the gardens so that our visitors can meet the lilies up close and personal. My hope is that folks can bask in and be enriched by experiencing the memorable, heavenly scent that is the lily. As I glance back at my to-do list I’m pretty confident that I’m off to a good start as far as filling in those open spaces in the gardens. I want the rest of my planting decisions to be driven by the needs of nature. I’m planning to consult with the bees, butterflies, and other members of the distinguished pollinator sector of society to see what I can plant to make them feel welcome.